Depending on how you’re using your R/C vehicle, you either want to make it as light as possible or you want it to have a bit of heft. While racing requires a featherlight machine, rock crawling tends to favor increased amounts of weight. Keeping that weight low and close to the ground can be a challenge, but thankfully there are a few ways to make this happen. The Carisma Scale Adventure Lynx is one vehicle in my fleet that I felt could benefit from some additional weight. While the rig is, for the most part, stock, I have thrown on a pair of Pro-Line Hyrax tires and Impulse Bead-Loc wheels. A perfect compliment to those wheels are Pro-Line’s Brass Brake Rotor Wheel Weights ($38.21). At 2.3oz/65g per weight, this add-on provides a significant amount of low-end weight in an easy-to-install package. As luck would have it, Pro-Line sent me a set of these weights to review and put to good use. 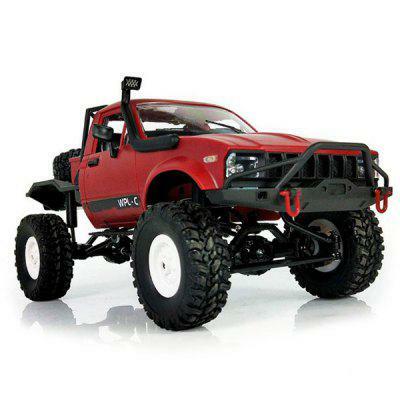 If your R/C trail truck or crawler is lacking in grip, you might need more than a new set of tires. Making sure your rig is planted when it’s climbing or descending inclines not only improves handling, but it also makes your experience more enjoyable. I’d rather have my radio-controlled vehicle on all four tires rather than tumbling down a hillside. To help improve overall grip performance, adding weight to your rig is another simple way to improve handling and stability. Pro-Line’s Brass Brake Rotor Wheel Weights are an easy way to add weight, provided you’re running their Impulse Internal Bead-Loc Wheels or 6-lug Hex Adapter. While there aren’t any installation instructions that come with these wheel weights, attaching them to your wheels is a simple process. That’s not to say that I didn’t encounter a moment or two of trial and error. Before you begin, remove your wheels from your axles (or if you’re starting with a fresh set of wheels, open the packaging). The weights install on the inside of the wheel and face outward. From my experience, the included mounting hardware isn’t needed when attaching the weights to Impulse Internal Bead-Loc wheels. Not only is the fit incredibly snug, but the hardware doesn’t appear to be long enough to reach the mounting holes on the wheel. To install the weights, simply line up the hardware mounting tabs with the matching indentations in the wheel and press the weight into place. If you need to reposition the weight, you can remove them by gently prying up and around the base of the weight. You can also pry against the mounting hole tabs, but use caution when doing this. *For those of you who are using the 6-lug Hex Adapter, you will need to mount the weight to that piece using the included mounting screws. Once installed, reattach your wheels and hit the trail. I noticed an immediate change in the handling performance of our Lynx once these weights were added. The rig now feels connected to the ground and is very stable when driving up uneven terrain. If you run Pro-Line’s Impulse wheels and are looking for some extra handling weight, Pro-Line’s Brass Brake Rotor Wheel Weights are worth adding to your R/C crawler.